Mazda RX7 Import Performance Radiators and Parts. Specializing in Import Drag Racing the Mazda RX-7, SR Motorsports.com. This pulley kit replaces the alternator, the water pump pulley, power steering pulley and the main pulley. They free up horsepower (With our SR Underdrive Power Pulleys our Project RX-7 gained 14 horsepower.) due to being 45% lighter than stock and by underdriving the crank shaft pulley, alternator, power steering and the water pump to keep down the chance of cavatation.Our SR pulleys are also larger than the competition's pulleys so the fan belts have a larger surface contact area ( so our pulleys _won't slip_ on the fan belt causing your rotary engine to overheat which is very common) Available in anodized hardcoated lightweight and strong 6061-T6 billet aluminum for years of trouble free use. Complete kit with everything needed. A very easy horsepower increase and nice looking addition to your Mazda RX-7. Simple to install with hand tools. Our Underdrive Pulley Kit Includes: Alternator pulley, power steering pulley, waterpump pulley, main drive crank pulley and all needed hardware. 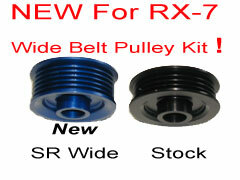 This Wide Grip Belt Performance pulley kit is for the high performance RX-7. It has a 25% wider pulley and 25% wider belt for extra grip with the high RPM and HP that a rotary RX-7 has. It replaces the alternator, the water pump pulley, power steering pulley and the main pulley.Not for cars using a smog pump. They free up horsepower (With our SR Underdrive Power Pulleys our Project RX-7 gained 14 horsepower.) due to being 45% lighter than stock and by underdriving the crank shaft pulley, alternator, A/C, power steering and the water pump to keep down the chance of cavatation. Our SR Wide Grip Belt Performance pulleys are also larger than the competition's pulleys so the fan belts have a larger surface contact area ( so our pulleys _won't slip_ on the fan belt causing your rotary engine to overheat which is very common) Available in anodized hardcoated lightweight and strong 6061-T6 billet aluminum for years of trouble free use. Complete kit with everything needed. A very easy horsepower increase and nice looking addition to your Mazda RX-7. Simple to install with hand tools. Our Complete Underdrive Wide Grip Belt Pulley Kit Includes: Wide Alternator pulley, power steering pulley, Wide waterpump pulley, Wide main drive crank pulley , with 2 brand new fan belts and all needed stainless steel hardware. All needed replacement high quality belts for your 93-95 SR Underdrive Power Pulley kit. 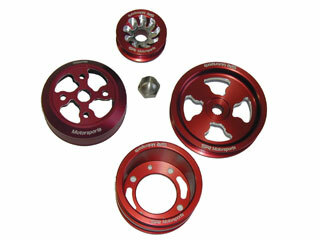 This Wide Grip Belt Performance pulley kit is for the high performance 20B 3-rotor motor. It has a 25% wider pulley and 25% wider belt for extra grip with the high RPM and HP that a rotary 20B engine has. 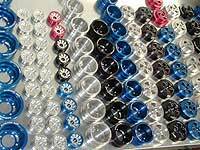 It replaces the alternator, the water pump pulley, power steering pulley and the main pulley. They free up horsepower due to being 45% lighter than stock and by underdriving the crank shaft pulley, alternator, A/C, power steering and the water pump to keep down the chance of cavatation. Our SR Wide Grip Belt Performance pulleys are also larger than the competition's pulleys so the fan belts have a larger surface contact area ( so our pulleys _won't slip_ on the fan belt causing your rotary engine to overheat which is very common) Available in black, blue, red and clear anodized hardcoated lightweight and strong 6061-T6 billet aluminum for years of trouble free use. Complete kit with everything needed. Our Complete Underdrive Wide Grip Belt Pulley Kit Includes: Wide Alternator pulley, power steering pulley, Wide waterpump pulley, Wide main drive crank pulley , stainless steel alternator nut kit with 2 brand new fan belts and all needed stainless steel hardware.